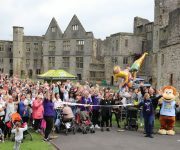 More than 600 toddlers and families pounded the paths around Dudley Zoo and Castle to pull in pounds for children’s charity Barnardo’s. DZG monkey mascot Monty was joined by TV’s Teletubby Po and charity ambassador Rebekah Vardy, of I’m A Celebrity fame, as the Barnardo’s Big Toddle got underway yesterday. And we’re expecting hundreds more youngsters … Continue reading Terrific toddling!